Achieve the protection and beautification of your dining table at the same time with our incomparable range of stainless steel coaster trivets. 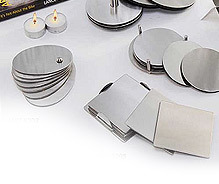 Top grade stainless steel of these coaster trivets protects the surface of table from hot dishes, while the various alluring and striking designs add a touch of fashion and appeal to the tables. True synonym of durability and reliability, these metal coaster trivets are certain to serve you for a long period of time. Our premium coaster set is the perfect style statement of an underrated elegance. This is simple yet functional. 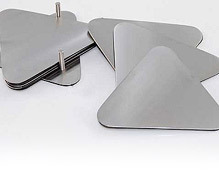 We present a unique set of finest quality stainless steel table mats that are designed in the shape of leaves. 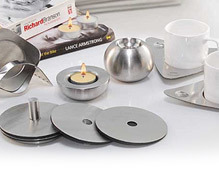 Metal exports offers you the finest quality stainless steel coaster set with the holder that is ideal for your personal or even professional use. 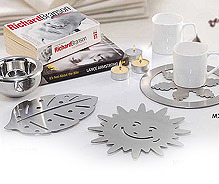 This set of durable steel coaster trivets brings an elegant yet light-hearted element to your table. Our coasters have rubber feet to protect table tops.